Bobsled, 5’10 x 20 7/8″ x 2 1/2″. (4+4+tail patch)+4 = 3.2kg. These dimensions are proving to be the most popular and successful for the ‘sled. In case you missed it, this board, once mastered, does some wonderful things on a wave at the possible expense of your next short-board session. For me the feeling is something like the linked up flow and tracky glide of a longboard combined with the security and responsiveness of a much smaller board when you drive hard off the bottom or hook up under a lip. Get all four fins engaged in a high line on a fast moving wave and you really start covering ground. 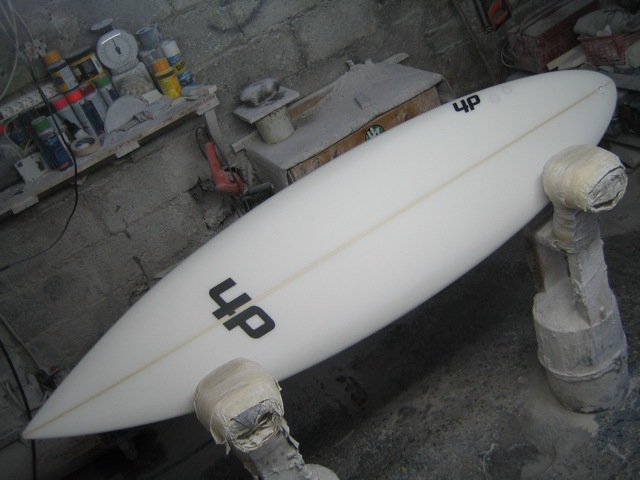 6’4 x 18 1/2″ x 2 5/8″. (6+4)+6 = 2.95kg. Rounded pin for general use in good head-high and bigger waves. Ronan’s choice of dimensions make this board suitable for some fairly solid days if he is keen. The general template has proven to be my favourite for boards 6’2 to about 6’6 at places like Crab and other occasional barrel waves with chances for attempts at big turns on powerful walls.